A zucchini flower is the pale yellow flower of the zucchini plant, from which the vegetable eventually grows. The flowers are often harvested and used in dishes on their own. The flowers are 3 to 4 inches long and generally tubular. This makes them easy to fill with stuffings such as riccota and herbs, or forcemeats of fish or crab. They are then often lightly battered and quickly fried. Unstuffed, they can be sauteed and served as a vegetable side dish. They can also be used as a topping for pizza. Orange star-shaped flower of a courgette or zucchini plant. Choosing: Look for flowers that are crisp and tight, newly opened, with no wilting on the edges. If the flower has been blossoming for some time, the pollen will help to deteriorate the flower faster. Imagine that you are eating one, a single-bite-size is the best size. Buying: Look for them at Farmer's markets in the early to mid summer. 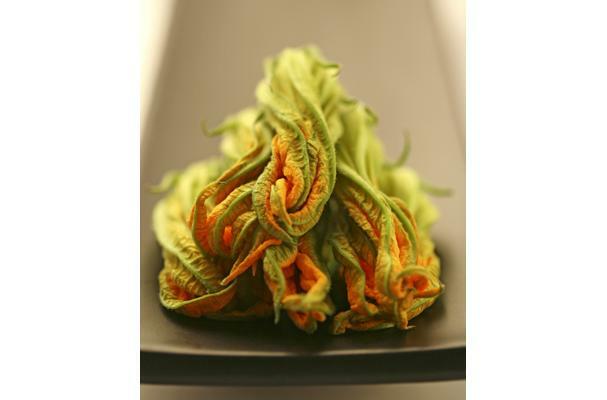 Some markets are now carrying squash blossoms, often with a tiny zucchini attached. Procuring: Courgette plants grow in the summer so you'll be picking flowers during summer as well. Harvest flowers early in the morning, when the flowers have only opened slightly and the orange petals are slightly peeking out. They require a small amount of cleaning, and you can open them easily with your fingers to stuff them with a delicate filling of cheese, herbs and some delicate vegetables. They are usually fried in a light batter and stuffed with ricotta or mozzarella cheese. These make an excellent appetizer or garnish to a main dish. Cleaning: Don't use much water when cleaning. The flowers are very delicate and don't stand up to much handling. Remove the stamen, which tastes bitter, and shake out the pollen. Flowers should be sprinkled with water, wrapped gently in paper towels and refrigerated. Use as quickly as possible. In Mexico, it is often used for soup and popular in a variation of traditional quesadillas. I love these delicate flowers deep fried in tempura batter. YUM! My mother used to make them when we were children, she was way ahead of her time when it came to cooking unusual foods! I love zucchini flowers, one of my favorite foods of summer!